I'm blowing this popsicle stand of a blog and taking my writing elsewhere! I recently registered a domain over at crupley.com and plan to continue to satisfy all my blogging needs over there. So update your bookmarks and feeds because I'm leaving Dodge and this place is gonna be a ghost town! I have been talking about it for some time but now it is official. I have accepted a new job and Mindy and I will soon be moving to one of our country's bay areas; the San Francisco Bay area. Specifically, San Jose and Silicon Valley. With this move I will finally complete my march westward to the Pacific Ocean. For those of you who might be worried, fret not, I will still be working with lasers and you can continue to make jokes related to laser sharks and popping pop corn from space. The big difference here is that now I can explain what the lasers I am making do; cutting, welding, and etching. I am also giving up my life as an international man of mystery and laser repair to remain firmly grounded and close to home. It was about time, too; I only had 3 stamps left to fill my passport. While I am sorry to be leaving the great state of Colorado and the wonderful people in it, it was time for a change and this opportunity was just too good to pass up. If I have to leave Denver, the Sunshine State, perhaps going to the actual Sunshine State is the next best thing. Right now, I cannot imagine enjoying any place more than I do Colorado, but even my imagination is limited and I just will not know until I try it. So I'm trading in my house for another apartment, mountains for ocean, blizzards for earthquakes, the Avalanche for the Sharks, and Governor Bill Ritter Jr. for the Schwarzenegger. The new job starts August 16th and I'll be in Colorado making my arrangements until then. (I should note that I moved to Denver on my 26th birthday and I am moving to California a full 2 days after my 30th, do birthdays make me restless?). I hope to see all you locals that I can before then and, afterwards, if you happen to be on the west coast, stop on by. I'll see you by the Bay! Lately, I have taken on the mindset that a birthday should be a time to celebrate life and do something that you have always wanted to do but never gotten around to. In recent years, I have sneaked out work early and hiked up to Boulder falls (fortunately before it closed) and I watched Top Gun at Red Rocks. Since I am turning 30 this year, I decided something a bit more extreme was in order. The other day, I registered for the Ascent portion of the Pike's Peak Marathon. Since the peak is about 13 miles from Manitou Springs, CO (just outside of Colorado Springs), someone thought it would be a good idea to create a marathon race that goes to the top and back. I, being of (arguably) sound mind and body, only registered for the Ascent; a one-way race to the top with a bus ride back down. People have been doing this yearly since about 1956. As if a 7700' vertical climb (11% avg grade) is not enough fun, you're doing it at an altitude of up to 14,000 feet where you only get about 2/3 the oxygen you would at sea level. They run the race in the middle of summer, but even then there can be snow falling on the peak. I really don't know if I am up for this craziness or not. I have been embarrassingly lax on my training lately, but perhaps a daunting goal like this will provide me the much-needed motivation. At least it will be nice to say that I tried it and I didn't die. There is probably a reason they have have the registered trademark for "America's Ultimate Challenge". Bookworm—you two will be so cute together! Apartment in London, England! Not bad! Qdoba as much as you can! No, your eyes are not deceiving you. 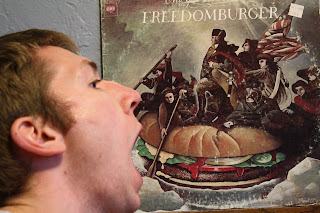 That is Freedomburger by the New York Rock Ensemble. At first, the sheer hilarity of both the album title and the cover artwork overwhelmed me, but I didn't want to waste my $1.99 on what was going to be, in all likelihood, terrible music (this was something that someone just gave away to the thrift store, remember). I hemmed and hawed for a while until Mindy finally convinced me to buy it. Who knows how or why. After carrying it around the store for bit though, I got to thinking: "Man, I love freedom", "What's in a freedomburger? ", and "Why didn't Washington captain a giant burger across the Delaware?". So I bought it. I got it home and threw it on the record player. In my head, I was envisioning some sort of American gastrointestinal disaster but I instead got an earful of some amazing vintage rock! I just had the great sound and songs that you feel like you've been listening to your whole life. Currently, the full extent of my knowledge of the New York Rock Ensemble has been garnered from Wikipedia. The band was started by 3 students at Juilliard in the mid 60's and they were known for turning classical music pieces into rock songs and for using classical instruments in rock and roll. Sadly, Freedomburger was their last album. The one modern connection that was made to the band is that one of the founding members wrote the theme music for The X-files. They recently re-released Freedomburger on CD so now you can head on over and check out some samples. My favorites from the album are "I'm Sending a Friend to You" and "Carry Me Up". I was so surprised by how much I loved this album. Perhaps it was because I went in with rather low expectations, or perhaps I should trust my thrift store radar more often. I'm just wrapping up another exciting business trip to the UK and its 2am and I'm completely wired for no reason. My flight back is at 7:30am which necessitated me setting my alarm for 3am (awake, shower, drive, return rental car, wade through Heathrow...) so it looks like I won't be getting much sleep tonight. This leads me to ponder my problems with jet lag. On my several unplanned European vacations lately, my sleep pattern has gone as follows. Night 1: Spent on a plane. Main flight duration about 6-8 hours. Lights on and activity on the plane for 2-3 of those hours. Day 1 I'm pretty wiped. Night 2: Usually accidentally fall asleep at 8pm or whenever I get into the hotel because I'm exhausted from the long night before. Sleep great, wake up early. Nights 3-last: Tired early, go to bed at a reasonable time, but as the days go on, I wake up around 4am for around an hour and this gets progressively earlier and longer in subsequent nights. Return day: Wake up early, catch a flight, gain ~8 hours and have an absurdly long day. Turn into a zombie around 7pm back home. Literally. Eating brains. Days back home: Wake up at 4am and get tired at 8pm. These get progressively later over the course of 3-4 days. The primary question is, why do I wake up in the middle of the night while I'm overseas? This usually doesn't go away over the course of a week either but I get tired and wake up at the appropriate times. 4am in Europe corresponds to about 7-8pm back home. What is usually happening then that I so urgently need to be awake then? A follow up to this is, why do I not feel the least bit tired during the days when I have been awake for a sizable portion of the evening? Back home, if I don't get 8 (and preferably 9) good hours at night, its tough getting up in the morning and I often feel tired throughout the day. A man standing at a urinal holding a baby.